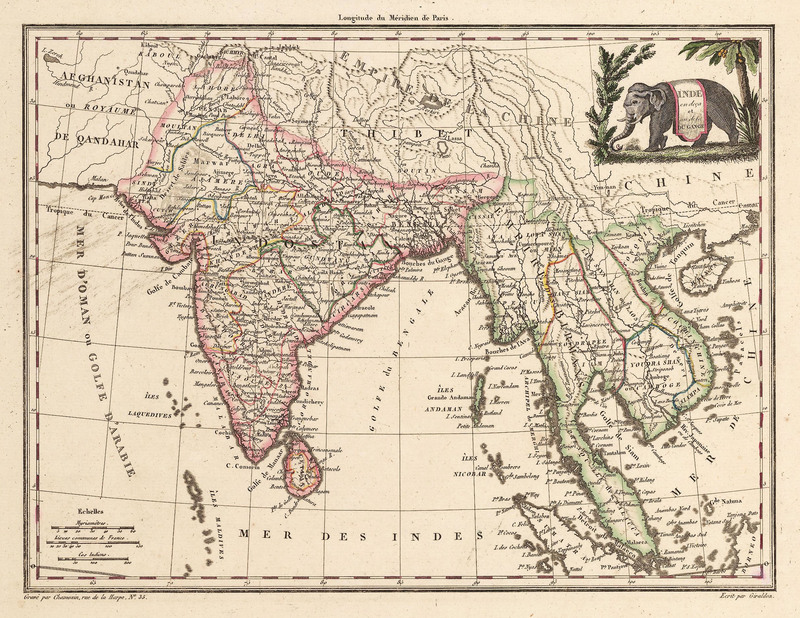 This lovely hand colored map depicts India and East India, including Burma, Thailand and Malaysia with national borders depicted as they were at that time. The map covers the region from Afghanistan in the west to 110th meridian east, from China in the north and including a portion of Borneo in the southeast corner. Though small, the map contains considerable detail, including all major topographical features, such as the enormous territory covered by the Ganges Delta, the largest delta in the world. India is shown in high detail, with the Arabian Gulf to the west and the Bay of Bengal, the largest bay in the world, with waters flowing straight from the Himalays through Bangladesh. Roughly triangular, they Bay, in addition to Bandladesh to the north, is bordered by Myanmar to the east and Sri Lanka and India to the west. A charming title cartouche featuring an elephant and tropical vegetation embellishes this elegant map. Condition: This map is in A condition with light printing smear from time of printing.